There are several steps involved in a personal injury case, and the process does take time. First, you’ll meet up with a personal injury attorney, who will evaluate your case and determine if you have a viable claim for compensation. It’s known as the initial consultation and is generally free of charge. During the initial consultation, you’ll need to be prepared to share the details of the accident, including your injuries and property damage. At the end of the initial consultation, the attorney will be able to tell you if you’re legally entitled to damages under your state’s personal injury law. Personal injury attorneys often accept personal injury cases on a contingency basis. This means, you don’t pay any monies upfront; the attorney keeps a percentage of the award after winning your case. A complaint is then filed with the court to initiate the personal injury lawsuit. Once the complaint is filed, the discovery stage will begin. This is the most time-consuming and laborious stage of the process. Both the plaintiff’s attorney and defendant’s attorney will be gathering all the information relevant to the case. It includes obtaining medical records, police reports, existing contracts, witness statements and employment information. Often, the defendant’s attorney will request that you give a deposition. The deposition is detailed and includes questions about how the accident occurred, previous injuries or illnesses and injuries that were a direct result of the incident. After all of the evidence has been gathered, each attorney will file court motions. These motions generally range from requesting that some evidence be excluded from trial to requesting the court to dismiss the case. After the court has ruled on the motions, it may require the parties to meet with a court-approved mediator to try to settle before trial. It’s important to note that during the process, attorneys from both sides to negotiate in an attempt to reach an agreed settlement. As a matter of fact, most personal injury cases are settled before going to trial. At the same time, some personal injury cases do wind up in court. It may be that the plaintiff’s insurance company feels their insured wasn’t responsible for the accident or that the request for damages is too high. In this situation, the court will schedule your case for trial. Keep in mind that the trial date may be months down the road, as the courts are typically backlogged with trial cases. The trial stage can take several weeks. During trial, each attorney will present evidence, exhibits and question and cross-examine witnesses and expert witnesses. Often, it’s a jury of your peers that make the determination as to whether or not you are entitled to compensation. The jury also determines the amount of compensation. If you are awarded compensation, the insurance company writes the check, and you’ll be required to sign a few documents. If the award is to be paid by an individual, it’s possible that your attorney may have to pursue that individual’s bank accounts or have wages garnished. Most personal injury attorneys agree that is often better to settle a case to avoid the long process of a trial. 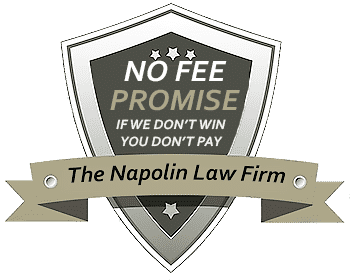 At the Napolin Law Firm, our attorneys are experienced in personal injury cases. They work hard to settle cases before the trial stage and have won substantial awards from insurance companies prior to trial. In addition, they are prepared to battle it out in the courtroom when needed. If you’ve incurred an injury due to the negligence of another individual, business or government agency, turn to Napolin Law Firm for representation. They will fight for justice on your behalf.